(UNAUSA and Business Council for the UN) 801 Second Ave., New York, NY 10017, Phone: (212) 907-1300. Find a local chapter HERE. AWIU connects women in the U.S. with women around the world, promotes woman-to-woman interaction and builds bridges of understanding through its delegation visits, grants, and local chapter meetings. AWIU delegations offer its members the opportunity to travel, meet and understand people of other cultures. AWIU is honored to partner with the United States Department of State to host the International Women of Courage Celebration and award grants to exemplary women around the globe. Visit AWIU Website. Turning Oppression into Opportunity for Women Worldwide: The Half the Sky Movement is cutting across platforms to ignite the change needed to put an end to the oppression of women and girls worldwide, the defining issue of our time. Visit Half The Sky Movement Website. What is CEDAW? Click HERE to read FAQs on CEDAW. Graduate Women International (GWI) advocates for women’s rights, equality, and empowerment through access to quality secondary and tertiary education, and training up to the highest levels. Their vision is 100% of girls and women in the world achieving education beyond primary school. They have national affiliates in 60 countries and individual members in more than 40 others. Please note: AAUW Association is no longer a member. We are an organization seeking membership from women graduates who have an interest in international issues affecting women and children worldwide. 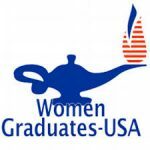 WG-USA is affiliated with the International Federation of University Women (IFUW).